As part of the 4th Edition of the "I Smile for the Camera" Carnival hosted at footnoteMaven's Shades of the Departed online publication, participants must pick a favorite photograph and explain why it is so. Like most family historians, I have many favorites for many reasons. Somehow, I narrowed them down to two. My favorite photo of ancestors would have to be one taken at my parents' wedding, because where else could I find a photograph of six biological and two step-ancestors? But if given a choice of only one photograph to keep of all the ones I own, it would be the following. I think it's obvious why. Source: Midkiff, Matthew and Melissa. Photograph. December 1996. Original in the possession of Miriam Robbins Midkiff, [ADDRESS FOR PRIVATE USE,] Spokane, Washington. 2008. The kids were watching Christmas specials on TV one afternoon and fell asleep. 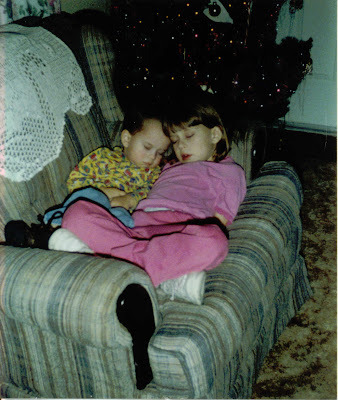 They used to love to sit in this big old comfortable chair (which we no longer own; it just got worn out), with their heads against one arm rest and, as they got older and longer, their feet over the other. The television is located just to the left of where I'm standing to take this photo. The antimacassar over the chair back was crocheted by my great-grandmother, Lillian Fern (STRONG) HOEKSTRA. This was the first Christmas in our "new" home (built 1907 - 08). My daughter had recently turned six and was in Kindergarten and my son was nearly three. Hard to believe that they'll be a high school senior and a freshman, respectively, this coming school year. Because we didn't have a digital camera then, this is a scan of a printed photograph. You can't really see the detail of the Christmas tree in the background the way you can when you look at the original, or the soft flush of their chubby cheeks. I can almost hear their soft, measured breathing, see the rise and fall of their little chests, and smell the warm, baby smell of my toddler and the "No More Tears" shampoo scent in my daughter's hair. This is one of those scenes that's going to stay with me as long as I live. Photos of sleeping children are so precious. I think it is the innocence that comes through. I can see why it is a favorite of yours. Family Tree Magazine Has a New Website! The 54th Carnival of Genealogy is Posted! It's Not Too Late to Join the Games! The 53rd Carnival of Genealogy is Posted!